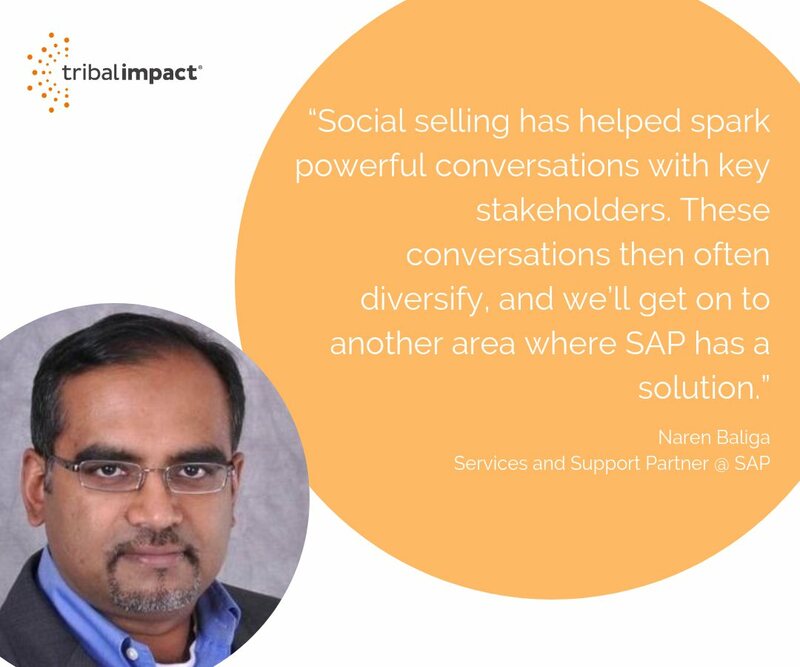 Recently, Tribal Impact had the pleasure of speaking to Naren Baliga, Services and Support Partner at SAP. He shared his experience of Digital Selling with us. A SAP veteran of over 10 years, Naren engages in tackling complex engineering challenges for customers, while keeping simple experiences in mind. We sat down to discuss how he applies this same ethos to his social selling activities. What we discovered was, it’s all about seeing the bigger picture in terms of the role SAP plays in the global technology scene and generating awareness so the community can benefit from what SAP has to offer. Naren believes social media can be a powerful platform to drive impactful but simple messages which appeal and educate a wider audience. “We’re living in times requiring constant learning. In order to thrive, we must act as multipliers and share our experiences. With time being scarce and conflicting priorities seeking our attention, how do we handle information overload? It’s easy- just keep it simple! He goes on to cite a recent mindshare between SAP's Jenn Morgan and Frances Frei, Professor at Harvard University, where the theme was “Simplicity - the new sophistication. “With the digital revolution upon us, we’re often dealing with digital commerce business models, and not just physical supply chains. You’re talking about massive scale - consider handling 100M transactions or tracking 5B events in your supply chain. This calls for broad as well as deep conversations on emerging enablers such as hyperscalers, AI, Robotic Process Automation, IOT, Analytics or Blockchain. The key is to abstract technology from business enablement, so you help customers “simply” realize the vision of the “Intelligent Enterprise”. For this reason, it’s important to translate complex engineering into easy-to-consume memos and demystify the ‘tech’ black box” he says, citing Bill McDermott’s RUN SIMPLE edict. Over the years, Naren has enabled innumerable field plays, empowering internal and external audiences. A few years ago, when SAP acquired cloud businesses, he was tasked by the Executive Board to upskill SAP’s global workforce on the pivot to cloud. “Steve Jobs once said, ‘…customers often don’t know they need something before they see it.’ In my opinion, that’s where social media comes in. 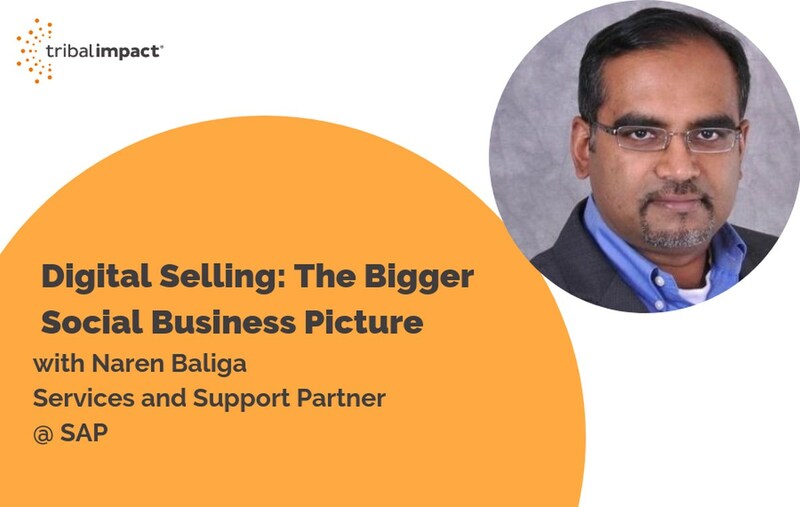 Social selling helps communicate what we’ve got to offer, in simple terms so customers can unlock hidden opportunities and drive value from their SAP investments”. “Tools such as LinkedIn Sales Navigator and GrapeVine6 help me to put context around my experiences, understand implications of M&As, and who the movers and shakers are. It’s not just social selling, but social listening to understand our customers, partners and practitioners in the SAP ecosystem. Social media allows us to adapt to the needs of our audience and respond in a meaningful way, almost immediately. If you’re listening to the conversations that are going on, you can flex your response to provide what is needed - Similar to real life conversations”, explains Naren. An ardent supporter of the UN’s 17 Sustainable Development Goals, Naren is excited about the potential the SAP Intelligent Enterprise brings, combined with our Intelligent Suite and Technologies, powered by a digital platform. He shares how SAP makes an impact in many different ways, from helping provide transparency into working conditions and uplifting business integrity toward a conflict-free supply chain, to being able to monitor the impact of natural disasters or weather events. This is the kind of impact he says drives him to share and evangelize about the SAP brand.